Synopsis: The Fault in Our Stars is the story of Hazel Grace,a 17 year old who was diagnosed with thyroid cancer at 12, and has come to terms with her diagnosis. She is ready to die. A miracle trial pill has stalled her inevitable death, but for how long? Hazel joining a Cancer Support Group, where she meets Augustus, who is in remission after having lost his leg to osteosarcoma fourteen months prior. Even though Hazel makes it her policy not to get too close to people for fear of hurting them when she dies, she can’t help but to start falling for Augustus. I fell in love with this book almost instantly. Gus & Hazel don’t have the typical “fall in love” story that everyone seems to have, they simply just fell into each other.Their story is about finding that in a bleak world there can be light, and that light may not shine forever, but it can shine beautifully & bright while it’s here. When I finished the book I wanted to cry, but more importantly I walked away feeling that the authour hit the heart of the story. That, much like death, life and love are not something you can control. And that hurt is not something you can avoid, but that you will be okay. I received my first Bzz Campaign from BzzAgent a little bit ago, and I'm excited to share my review with you. Initial feelings: I've been a crest fan for years, so I was more than happy to be able to review a product with a name I know & trust. 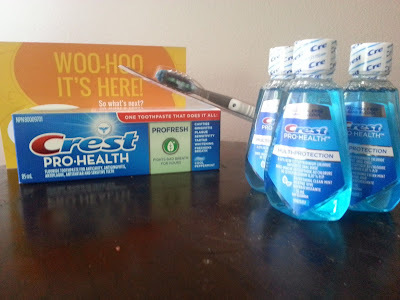 Tooth paste (5 stars): I can say that the toothpaste left my mouth feeling and tasting cleaner & refreshed even after 1 use (and eating shrimp!) without having an incredibly over-tasting mint taste, which was nice. Tooth Brush (5 stars) The toothbrush was very soft, like brushing your teeth with a cloud. I wasn't sure at first that a toothbrush that soft could do a good job. I am also used to an electric toothbrush, but I used it for a week. Despite feeling like it's not doing much of anything, the toothbrush did a great job. 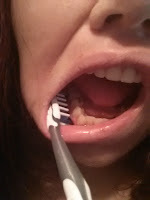 The rubber bristles hugged the outside of my teeth while the fiber bristles went to town on my the tops/sides of my teeth, for a combination clean that is unheard of. I may just be switching from my faithful electric brand soon! Mouth Rinse (5 stars) As far as mouth rinses go, I really liked this one. Much like the toothpaste, it has a refreshing flavour that doesn't leave an over-all burning or over powering flavour in my mouth. Bottom line: Would I recommend these products to other people? For sure! I liked these products enough that I'm changing my family over to them with our next shop, so of course I will be (and have been) recommending the products to friends and family. Do you have something to add/say? Feel free to comment below with your own opinion! BuyVia, a smart shopping mobile app and website, is ramping up for the back to school shopping season! The brand new Google Nexus 7 valued at $229 is the perfect back to school accessory with HD display, a long lasting battery and a front facing camera. This is the newest tablet to hit the market and is thinner, lighter and faster than before. You can get the app in the Apple Store or in Google Play. One lucky winner will win this Google Nexus 7. To enter, just use the Giveaway Tools widget below. This contest is available to all residents of the US and Canada, age 18 and over. It will begin now and will end on Sept 2 at 11:50 pm PST. The winner will be picked at random from all of the entries by the Giveaway Tools application. More terms and conditions are included in the giveaway form. Disclosure: I received no compensation for this publication. My opinions are my own and may differ from those of your own. PUT YOUR BLOG HERE is not responsible for sponsor prize shipment. Please contact the organizer of this giveaway with questions or to have your business or blog featured in the next big giveaway event. Oh How Pinteresting: A weekly link up over at the Vintage Apple, show casing beautiful pins from..well, everywhere! If you're interested in playing along, head on over to The Vintage Apple & add your link!! and I have to say, not only am I impressed with the book, but for once I am actually pretty impressed with a tv series made from a book. The book itself was slow to start, like most are, but soon enough was hard to put down. I found myself falling in love with characters, and crying over them. They had a very human quality to them, something that many books often lack. The story line is full of twists that you don't expect,and kept me on my toes, even though I knew from the tv series the general idea of what was coming next. This book seems huge, but once you dive in it doesn't seem so endless, so don't let that be the reason you don't pick it up. If you like the fantasy genre, you should definitely check out this book. Enter Canon’s E0S 70D Fantasy Kit Contest for a chance to win a new DSLR, an L Series Lens, and other accessories! http://Go to their page for your chance to win! This summer McDonald's has released two new items to their McCafé® menu, the Coffee and Vanilla Chai Tea Iced Frappé. I'm not a coffee drinker typically, so I haven't tried the coffee, but I am a fan of Chai Tea in almost any form, & vanilla is one of my favourite flavours and scents, so when I heard about this I couldn't wait to try it out! I have read that people say it's really sugary, I didn't find it too over powering like I have with other drinks, but I'm sure if you don't typically like sweets or eat them often it would seem that way. I could definitely taste both the vanilla and the chai, but neither was very overpowering, which was nice. Of course the downside is the calories and sugar content, of course. for a medium serving (479 g) there's 580 calories & 74 g sugar (on the plus there's 50% daily value of Calcium) You can check out the full nutritional facts here. Right now McDonald's is offering 50% off their McCaffe via "Frap Tap"
Find out how to redeem your coupon here. Who would I suggest this to? People who like Chai tea, people who like vanilla milkshakes, people who like trying new things or who are feeling adventurous. Now, I'm all for breastfeeding. I breastfed all four of my kids. I am an advocate for breastfeeding and of nursing in public, but I think this is really ridiculous. Here's this new mother who has already had the world watching her every move during pregnancy,trying to do whatever is best for her and her family. New mothers have enough pressure, including the Duchess, why add to that pressure by making her feel she 'has' to breastfeed, and a certain way because people look up to her. I don't know where people get off thinking that they can decide what the Duchess should or shouldn't do, how she will or won't raise this child, and her actions will affect other new mothers. Whether the Duchess, the princess before her or the Queen choose to breastfeed or not (or publicly or not) didn't influence my choice at all. In fact I don't think most new mothers are going to think "gee, the Duchess of Cambridge breastfed, I better get on that" If a new mother wants to breastfeed, she's going to, if she doesn't want to, she's not going to. Leave this new mother alone and let her make the choices that are right for her & her family, like every other new mother. I've always been a music girl. If I didn't have my nose in a book, I had my earphones in, blaring music from my Walkman (yeah, I'm old enough to remember using a Walkman, and even taping my favourite songs off the radio) Actually, most of the time I was reading & listening to music. The age of internet has made listening to the music of your choice that much easier, with things like youtube etc etc. I have been a Songza user for a while now, but was recently introduced to Deezer. I really like Songza. All the pre-created, searchable playlists. Picking a mood and just going with it. All of those things are pretty great options. Deezer has those, and then some. Not only can I listen to pre-made playlists, I can create my own. I can listen to music by artists like ones I like. It just seems that Deezer has many more options, which I like. I also liked that I can pick an artist I like, and Deezer will also play other artists like them, so that I can discover new music. The walk down memory lane of music from my teenage years (hello 90s) is nice too. The only downside I can find to Deezer is that after 6 months you only get 2 hours a month of streaming on a free account, but the good news the monthly cost isn't expensive at $5 a month. Who would I suggest Deezer to? Anyone who likes music, and being able to create their own playlists or listening to pre-created lists and add their own.Anyone who wants recommendations to new music based on their own likes. I didn't 'dislike' it, but I didn't love it. I came in expecting more, I wasn't all that impressed. Sure, the hot parts were still there, and some of it hotter than before, but it still left me wanting. I felt it had more filler than anything else, and not enough real story line. It really felt like it was being dragged out in order to feed into the next book, which I will read because I want to see where this goes. I've seen this book multiple times on various store shelves. I've picked it up multiple times, and put it back (usually in favour of another book) I just wasn't sure if I'd like it. I finally started to read it, and found not only did I *like* it, I couldn't put it down. It took me five days to devour this book. Two of those days were weekend days when I had children around. To be honest, if I just took out the hours, I probably spent about an hour a day on the book. I couldn't put it down. There were some turns I was sure would happen like Cinder being the missing princess but the way those things happened did not happen when I thought they would, or even how I thought they would. I am definitely happy to have finally picked up this book. I can't wait to dive into the second book "Scarlet"
"It affects your mind so that you cannot think clearly, or make rational decisions about your own well-being." A friend of mine suggested I read this book. I hadn't heard anything about it until it was suggested, but figured why not? I really enjoyed this story. The characters and story line flowed nicely with each other, and just when I thought I could guess what was going to happen, the story took a different turn. Especially at the ending. I can't wait to dive into the second book. September is too far away!!! I was going to try to drag this book out since the third book doesn't come out until September, but i just couldn't do it. I could not put it down. I loved the internal struggles Tris faces, about Will, her parents, her loyalties and even Four. The ending definitely left me wanting more, and i can't wait for September to get here.I'm going to dive into "The Rise Of Four' next, and hope that it will tide me over until then. This book was a page turner. If there were more stars to give, this book would get them.